I know very well that no leaf on tree may stir save at the will of the Creator; since he asks that I die in this place, His Holy Will be done. But I haven’t committed any crime! Although… I suppose after a hundred years it does help to jump-start economic diversification, if not to make it easier to paper over social issues. Oh, I am conflicted now. It is still only 1887… we can certainly try to press our claim to Sabah. Rizal himself attempted to emigrate there with his whole clan to create a Filipino enclave under British rule. Probably not worth it due to a majority Christian nation trying to press a claim to a majority Muslim kingdom, but that’s British North Borneo’s problem. There’s few things to pick up a loyal Spanish citizen than the knowledge you’re doing something to inconvenience some fecking Englishmen by your mere existence this morning. “For someone who claims not to value wealth, you certainly seem to extol its virtues overmuch,” Elias interrupts my thoughts, grabs me by a sleeve, and prevents me from walking into a ditch. “I have Keynes and Friedman in the brain, I cannot help it.” (‘Cain is a freed man?’ Elias mouths out dubiously.) I cough and gesture with my cane to the coconut trees planted alongside the road. “Wealth is access to resources, this is true, and resources are tangible proofs. But wealth is also generated by the expectation and desire for these resources. Only fiat currency is capable of wealth generation on such scales; disentangled from the precious metal standard, which only have value in so far of their rarities and shininess; a representation of people’s future wants. A potato is literally more valuable in objective terms. It is early in the morning and we are having breakfast in Don Anastasio’s house. Old Tasio’s servant does not hesitate anymore to allow me to simply barge in. It is in fact too early in the morning, it barely even bright out. My own servants are perhaps feeling a bit insulted that I don’t dine in my own house as much, and scandalized that I am preferring to do so in a house with an unmarried woman. Is it her cooking, and her other common points, that I’m after? “I brought dried squid?” I mention as a peace offering. “The Church of England aside, in here we might see how we might reform the justice system. The courts must not be easily influenced, the judges should care more for evidence than oratory. They must not have a rooster in the game. “Then-Governor Izquierdo magnified the situation of mere 200 soldiers mutinying over the loss of their promised privileges (such as the exemption to the tributes and polos y servicios and the loss of their pension), and the prohibition of the founding of school of arts and trades for the Filipinos, which the general believed as a cover-up for the organization of a political club; all into an uprising against Spain. Those poor souls in 1872 expected support which did not come, mistaking fireworks in the city as the sounds of other soldiers rising in revolt. “I am not afraid for the simple reason that sedition is a crime, and as such as a future criminal I either do not believe that I will be caught or will be able to escape or mitigate the consequences of my actions. I shall fight for my accomplices greater than I would care for my own fate; fear not, for you shall have the exit strategy that I may not use for myself. “Thus we return to your idea that we do require wealth before you will allow us to revolt.” Elias scoffs. “Where do you think to take the money for such a noble enterprise?” asks Old Tasio. “Without freedom, there can be no justice. The powerless and the powerful must be judged as the same under God! The more you ask us to delay, the more poor folk die under the lash; they are hauled off in the polos y servicios to work as little more than slaves, for though the law says they should be paid for the labor in public works, they are barely even fed! Women are taken by whoever fancies them, the rich grow richer while the poor suffer forevermore! “If that is all you want, then you might as well wear a black mask in the night and wreak your dark vengeance!” I blink. “Wait. That… huh. “Hear me out! And not in the sense of the collective lives of its people, or its culture, or its lands and history – but in something more, in the crossing of all of these, something inextricably and evidently its own. Existent and separate. Often times dormant, but sometimes can fill its people with a powerful resolve. Invisible yet tangible all through recorded history. It is a spirit born of mankind, but nonetheless divine – for the breath of life that God placed in us is one we can share with our works. “Our lives, our loves, our passions! In time these will end. But as our loins beget children, our actions and longings beget history. Cultures shape other cultures, thought begets thought – and in the crossing of these forces, the dream becomes real. “Elias, we have not finished our discussion from last night. Don Anastasio, to you I also ask; for this is a question that must first be resolved before any hope of reform or revolution can succeed. Elias stares at me with that dark penetrating gaze of his. The pains of his past and the cries of the present cannot be wiped clean by any amount of pretty words. His fingers drum upon the table. His purpose remains sure, but he has admitted last night that he has no clear answer. “Before Spain, we were a collection of fragments borne of individual tribes and petty kingdoms. We are Tagologs, Ilocanos, Visayas, people of different provinces and different tongues first before all. Spain’s dominance, there a rose the cry of regions and factions opposing Spanish rule, and pirates and foreign invaders attempting to seize dominion, but ultimate all of them failed. What sort of soul could be born from that? “If our Philippines has a soul, then it is as a daughter of Spain!” exclaims Old Tasio. “I agree,” and I lean forward to speak “Yet there are ways of peaceably gaining nationhood. Take Canada, for example. They exercise great latitude in their own affairs while officially owing fealty to the British Crown. One might imagine in time, that for ease of taxation and infrastructure, the Empire quietly lets them go to be their own nations to pay for their own works and armies that could still be volunteered to serve their parent. Bagumbayan being, of course, that section of Luneta Park where executions are carried out. 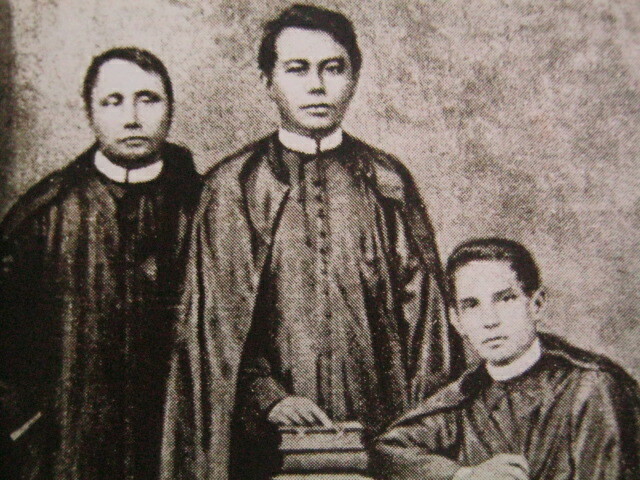 There the three priests Gomburza died of garotte, and where Rizal himself would die by firing squad. Elias glances at me. I shrug. Uh, Elias, could you phrase that a little better? “In those dark woods I have been made to confront how a person’s choices might affect far more than just those around him, causing pain that through generations. His great-grandfather has caused mine a great injustice, but could I not in my callousness become an abuser to an orphaned child in return? It is easy to call for revolution when you are not the one who will die from it; I hold no such fear, but as a leader of men it will be my decision to make fathers die and families wither on the vine. “No, the revolution is unavoidable. What you simply need is time, the right time to prevent Spain from landing twenty thousand troops and artillery to suppress yet another revolt; to prevent again using the Pampangans against the Batangueño, the Tagalogs against the Bisaya, or to ignore the Moro as a Filipino. ”Our ancestors fought with valor too, and they died. Because they were men with swords and shields against guns and cannons. Even if we throw off Spain, she is the weakest of the Great Powers. It means little. We must first become united, to galvanized as a people from shore to shore, from island to island, that Spain must either come to understand that she must treat us as equals – as citizens of Spain with all rights, or we will leave her to wither on the vine! To do this, it is important that the people know that they are not alone – that their suffering is shared by other citizens, no longer merely Kapampangan or Cebuano, or Tsino and Indio, Insulares and mestizo, that all who are born and live on these islands are Filipino! And even stronger are pictures and motion pictures; I did not add. Soon enough it will be all made clear. A little while later, teacher Navidad has come. “Don Crisostomo, what happened to your face!” he exclaims upon ascending the stairs leading up to the sala. “Simoun?” Elias echoes with a frown, as he looks up from the novel. Old Tasio is nodding, completely engrossed with the text, as if having a conversation with its characters. Let me ask you this, what sort of fool sets off a fireworks display at five-thirty in morning? Filipinos do. And it is not even in celebration or to wake people up for the morning mass. The fireworks are set off in the approach of the early morning procession. [*] Screw all those infidels who want to sleep in. People march around town singing hymns behind a statue of the Virgin Mary, for it is the eleventh of December and it is the Feast Day of Our Lady of Peace. It is celebrated by the Confraternity of the Holy Rosary. Between this day and tomorrow, the feast day of San Diego celebrated by the Third Order of Laymen of the Franciscans, there is somewhat of a competition in piety. It is still dark outside. Yesterday several raised platforms were set up around town in the path of the procession. The fireworks were to be set off from these platforms – how convenient then, that someone had decided to place field cameras on the platforms as well, that a picture might be taken at the same time the fireworks illuminate the crowd. And it is such a crowd, for though they were required to wake up at around four in the morning, it seems half the town is here. They will be obliged to do this again later tonight for the nine o’clock mass to conclude the Holy Mother’s Feast Day. The more uncomfortable it is, the greater piety, and because it is too dark to see the finery you wear, the greater pious rewards – no one might claim you are here simply to fulfill your rote duty, to be seen and respected. This is also why the crowd seems to be mainly women. Pop. Pop. Go the fireworks. Click, I push the shutter up for half a second, click, back the shutter goes. A photographer must have the proper timing, for too much exposure of the dry plate would give a blurry image. From beneath the black mantle covering my head, shoulders, and the back of the camera, I pull out the sealed box containing the dry photographic plate, and insert another. I take another exposure, this time in the dimmer light only of the lamps around the platform and the paper lanterns of the townsfolk. And then it is only time to pull back the lens and the bellows of the Anthony Fairy Camera into the box and direct a servant to bring it to my house. Beside me, Teacher Navidad yawns. We must now race ahead of the procession into the next platform. The solution I have found to the bulkiness of this era’s cameras is simply to have multiple cameras pre-positioned to take photos of the events of the fiesta. I did not need to fear someone stealing away my cameras, for the other young scions of the town had volunteered the manpower of their servants to stand guard overnight in exchange for future goodwill. Unlike our fathers, we have not yet taken the time to turn small insults into lifelong enmities. The servants are all invited to my house after standing guard for a sumptuous breakfast, of course. My own employees actually seem a mite annoyed that I haven’t been taking advantage of this pseudo-feudal authority I have, it looks to them as if I do not trust them or something. So, the more work I have them do the happier they are, which is a truly strange paradox considering how much Filipinos love to avoid work in this era. To have friends, be a friend, that is how the saying goes. I remain somewhat of an introvert, being all this cheery and active is exhausting. But the truth of that saying is actually – to have a friend, be genuine. You could have supporters if you keep telling them only what they want to hear, but they will turn on you when you fail to live up to the idea of you they have in their head. To have a friend, all you have to do is to articulate it – to say it – and make it real. Actions don’t speak louder than words, in this instance. Humans need to know for sure before we can trust it. It is saddest to me that the world of politics and high society is full of doublespeak and claims of friendship that mean nothing. We walk along the dirt road, beside the masses humble in their devotions. As we pass them I belt out the cant “Aaaave! Aaaaave! Aaaave Maaariiia! Saaalve! Saalve! Salve, Regina!” Hail Mary, Hail Mary! Save us, Our Queen! The world is full of misery, we cry out for salvation and mercy. But if we can stay strong, and just endure through these two decades, it will be worth it. The world is cruel! The world is amazing! There is greatness waiting for you! Humility is rewarded, charity shall bear fruit! You walk in darkness now, but the dawn comes, and even then there is truth remaining in the shadows. The dark is not something to fear. Those who dare step out into the unknown shall walk with the saints. Carry your faith into the next century, my people. It is a more powerful thing than you might think! I do not want to walk past this road, into the falseness of the world of the so-called the powerful. The greatest of monsters are those who shine brightest in the light. Save us, Oh Maria! I turn to the shout, to see a young woman gaily waving her fan at me, only to be sharply shushed by her elderly aunt. It is Sinang, Maria Clara’s friend. I doff my hat and bow at her. I point off towards Capitan Tiago’s house. She nods back. Yes, Maria Clara waits. “I thought you were enamored with Maria Clara?” the teacher responds. Maria Clara’s grace, and my intellect, and pampered by her Aunt Sinang’s lack of shame; let us raise the perfect politician! Wait. Is that not just Miriam Defensor-Santiago?